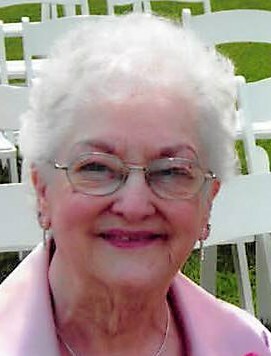 Muriel Edith (VanVleet) Beasley, loving wife, mother, grandmother, great-grandmother, and friend passed away at the age of 96 on March 20, 2019. She had been ill only a short period. Muriel was born and raised in Dundee, Michigan. She graduated from Dundee High School in 1940. She married Raymond Beasley on May 22, 1941. They were married for 66 - 1/2 years until Ray’s death in 2008. She lived in Michigan until 2016 when she moved to Granville, Ohio. During her years in Michigan, she worked at the Bomber plant in Willow Run during WWII. Later, she worked for Montgomery Wards in Ann Arbor. She also worked at the University of Michigan where she retired from in 1978 after 10 years. Muriel enjoyed many things. Her family, her love of the Univ. of Michigan football team, her years wintering in Florida, her many friends, and her love of life. She was best known for her laughter and sense of humor and she always had a smile on her face. Surviving are her two daughters, Bonnie Montgomery and Pam Wilson; 7 grandchildren; 7 great-grandchildren; and 3 great-great-grandchildren. Muriel was preceded in death by her husband, Raymond; a son, Jon Chris (Jack); two brothers; and her parents. There will be a memorial service later in the spring per Muriel’s wishes. In lieu of flowers, donations may be made to Wounded Warriors or Disables American Veterans.